RIO DE JANEIRO, BRAZIL – Eusébio, one of the greatest ever players to have graced a football pitch, died yesterday aged 71. The former Portuguese international was the top scorer at the 1966 World Cup in England with nine goals, and until the emergence of Cristiano Ronaldo, was considered the country’s finest player ever. 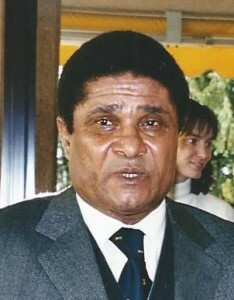 The great Eusébio in 2001, photo from Wikimedia/Wikimedia Creative Commons License. Originally hailing from Mozambique, the forward notched 41 goals in just 64 international appearances, helping Portugal to third place in the 1966 tournament. Generally considered one of the most lethal finishers in the history of the game, his official record stands at 733 goals in 745 matches. The former striker remains an idol at Portuguese club Benfica, where a statue of him stands outside the club’s stadium. While at the club, he won ten Portuguese league titles and five cups. He helped the club lift the European Cup, now the UEFA Champions League, in 1962, converting a penalty in Benfica’s 5-3 win over Spanish giants Real Madrid. He was named European Footballer of the Year in 1965 before losing the 1968 European Cup final with Benfica to Manchester United. Eusébio also had spells in the U.S. and Mexico, before becoming an ambassador for Benfica.